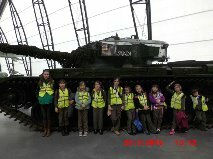 The Brownies and Rainbows had a great day at Cosford there was lots to see and do. Brownies Birthday Party held at Mrs Arthens Home. 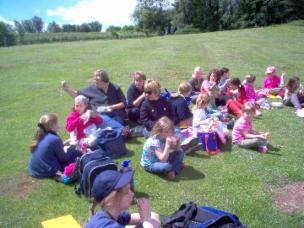 The event was well attended about 65 children in all. 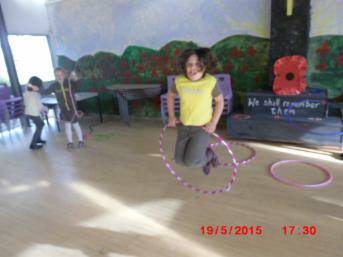 St Martins Brownies, St Martins Rainbows, Whittington Brownies and Gobowen Rainbows. The girls all had a B B Q and Birthday Cake. 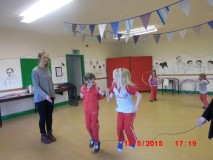 We played games, sang songs and made new friends. *June /July will be working on their riding badge many thanks to a parent. She is coming to speak to the girls about looking after horses. 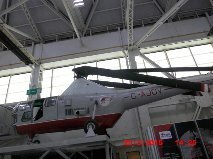 She will bring in the safety clothes, and equipment needed to start. 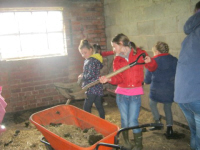 *June 15th The Brownies have then been invited to spend the day at her home mucking out/feeding and learning the hands on jobs to looking after a horse as well as the fun of riding horses. *June 18th is a night not to be missed we have two fire man coming to work with the girls on their fire safety Badge again many thanks to the parent for arranging this for us. *June 22nd 10.30am we are holding a work party Day at the Methodist church to clear the garden ready for planting fruit trees and edible foods, many hands make light work. Come along and see what we are doing.Please bring working gloves and boots if needed on day. 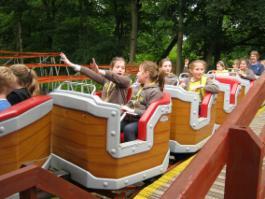 *June 29th the Brownies are going to Gullivers World for a fun day out with hundred's of other Brownies. 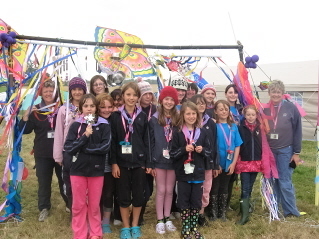 *July 9th the Brownies have been invited to join the Guides with outdoor fire cooking.The term is packed full of fun things to do and lots to look forward to.If any body wishes to help or has any questions about the events Please contact Brown Owl on the above number. 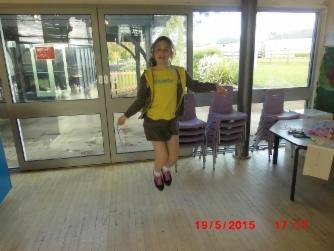 If any girls wish to join Rainbows, Brownies or Guides you can join us through the Girl guiding web site. 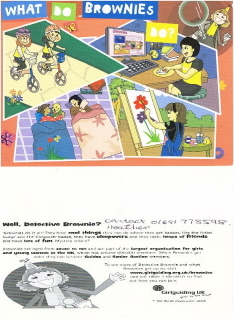 www.girlguiding.org.uk. 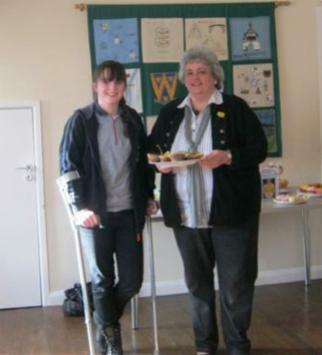 Congratulation to two of our Guiders/Brownies for securing 2nd place in the Grand Bake Off. 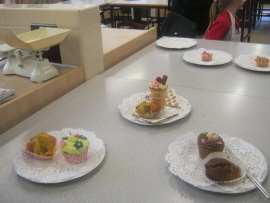 Alice Grey, Jamsin Tickeu and Mae Anne Tellow took their places in the cook room and baked their cakes and decorated them. 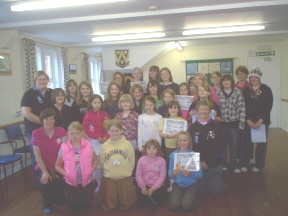 At the Ellesmere Road Chapel the Brownies Invited the community to a tea party. Each Brownie waited on a table serving sandwiches and cakes, pots of tea were brought, do you remember where every cup of tea was served from a pot and not via a bag? Each Brownie had questions to ask those who were able to remember the Coronation of Queen Elizabeth II. Did you watch the Coronation on TV? Did you have astreet party? What did you think of the day? What did you wear? The answers were, as you would expect, very varied and colourful. There was quit a buzz about the room as some of the older members of our community talked about their memories. 60 years since the Coronation, do you remember that day? Can you share your memories? you would send me an email , telling me what you did on Coronation Day? send to suescho@hotmail.co.uk and I will publish them here. 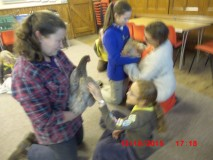 Had the 2nd bake of at Lyneal on Sunday last, our Rainbow went through and St Martins Guides but sadly not the Brownie. What are the Guides and Brownies up to? 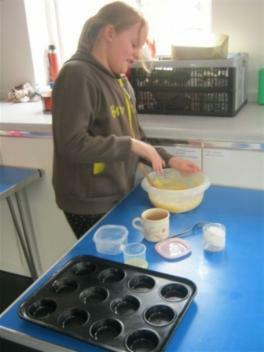 The Brownies, Rainbows and Guides have been busy taking part in a 'bake off' where they had to bake and decorate small cakes and muffins. They got judged and the winners were Jasmine from the guides with her decorated garden on a muffin, congratulations to Lily Mae from the Brownies for her decorated small self cooked cakes and to Mae from the Rainbows for her decorated cake. The girls all go to the next round at Lyneal on March 11th to see if they can get through to the final round. We have vacancies for girls to join the Rainbows they must be aged between 5 & 7 year olds we meet on Monday evenings 6-7pm at the Methodist Church in St Martins. Please contact Heather on 01691 778598 for further details. for centenary party with units from all over the Midlands. 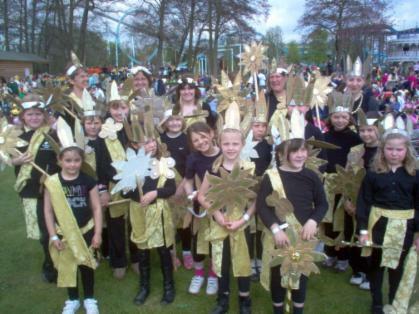 Shropshire was given the colour gold to make costumes. 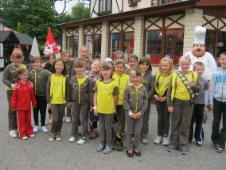 We paraded around Drayton Manor in the morning, then we all had fun at the fair. 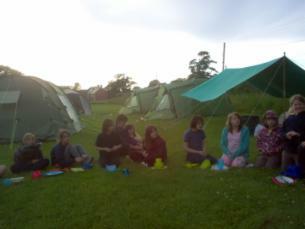 Camp at Lyneal with the rainbows, brownies and guides. 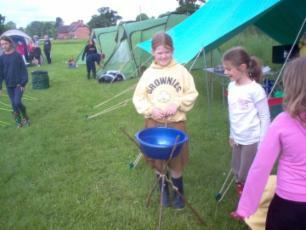 Guides demonstrated camping skills in the near by field showing how to make a bowl holder to wash up out of sticks and cooking skills. and the Brownies at the School. 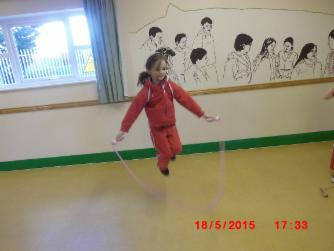 Skipping to raise money for heart foundation. Total still to be collected ,but over £150.00 thanks to the parents of both groups.